June 25, 2004, C Schmidt. Lasionycta quadrilunata is a small day-flying noctuid moth (FW length 11 - 12 mm) with dark gray to olive-gray forewings with obscure markings and white hindwing with black large discal spot and marginal band that flies over alpine tundra in northern British Columbia in our region. 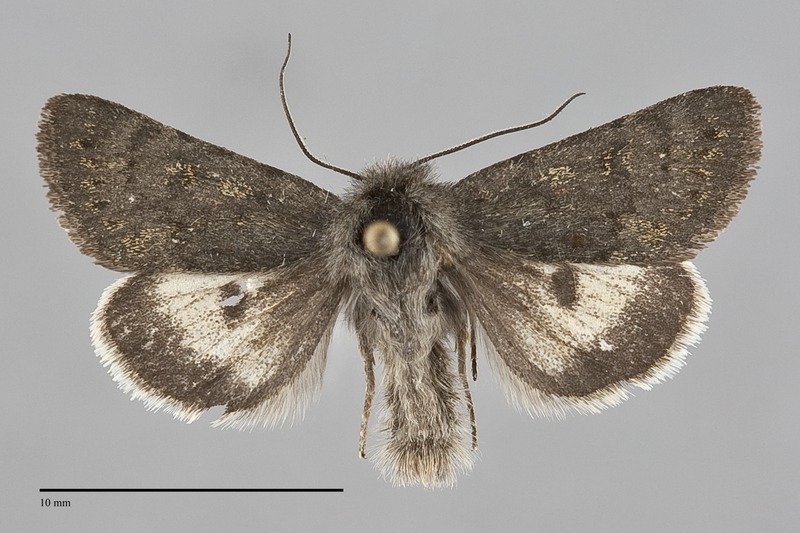 The forewing is slightly pointed at the apex and is uniform dark gray to olive-gray in color. The lines and spots are faint darker gray. The antemedial line is sinuous, bent at the veins, and the postmedial line is scalloped. A row of dark spots is present in the subterminal area in some specimens. The hindwing is off-white with black large square or ovoid discal spot and sharply defined marginal band on the outer third of the wing. The hindwing fringe is white, sometimes slightly yellowish. The head and thorax are dark gray. The male antenna is beadlike or weakly biserrate. Two subspecies of L. quadrilunata are recognized. The nominate subspecies is restricted to the mountains of Colorado. It has lighter-colored forewings with contrasting dark markings. Our populations are assigned to L. q. yukona Lafontaine, characterized by darker gray color and obscure markings. This species occurs over alpine tundra above timberline, particularly on dry, rocky scree slopes. It may be locally common in this restricted habitat. 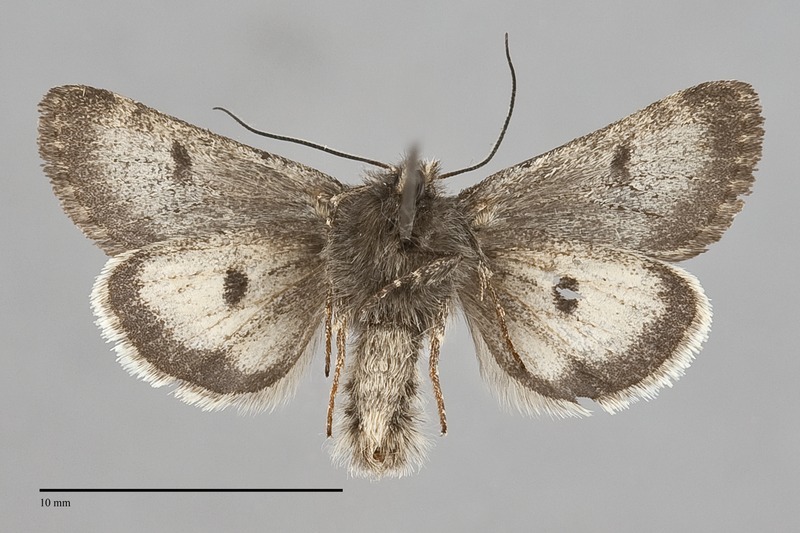 Lasionycta quadrilunata has not been collected in our area, but it doubtless occurs in northern British Columbia because it has been collected within miles of the border in Alberta and Yukon Territory. The distribution of this species forms a slightly curved arc on a map of western North America. The known localities are south-central Alaska, southwestern Yukon Territory, western Alberta, the Beartooth Plateau on the Montana-Wyoming border, and central Colorado. No information is presently available regarding larval foodplants of this species, but it probably feeds on alpine herbaceous vegetation. Lasionycta quadrilunata flies during the summer, usually from June to early August depending on snow melt. This species is diurnal and visits flowers during the day. It has been collected rarely in light traps placed in its alpine habitat (Doug Macaulay, personal communication 2009).